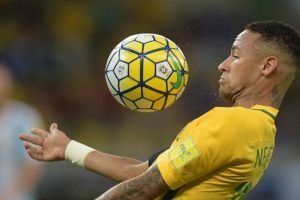 Continue reading "PSG offered Neymar over $44m annual salary, says agent"
Continue reading "Neymar strikes as Brazil sink Colombia in qualifiers"
Fan knocks over Neymar in Brazil training! Continue reading "Fan knocks over Neymar in Brazil training!" Continue reading "Brazil have many leaders: Dani Alves"
Continue reading "Pique agrees with extra holidays for Neymar"
Continue reading "Neymar gets permission to stay in Brazil"
Continue reading "Want Neymar to remain captain: Brazil coach"
Continue reading "Pele congratulates Brazil on Olympic football gold"
Continue reading "Neymar crowned samba king as hosts end on a high"
Continue reading "Neymar holds nerve as Brazil win Olympic football gold"
Continue reading "Rio: Brazil enter men’s football final; to face Germany for title"
Continue reading "Neymar is a monster: Brazil coach Rogerio Micale"